For a personality as idiosyncratic as Freddie Mercury and a band as revolutionary as Queen, their biopic is incredibly lackluster and surprisingly uninspired. From the early days when he first met his band mates to Queen’s performance at the Live Aid benefit concert for Africa in 1985, “Bohemian Rhapsody” follows Farrokh Bulsara, now known as Freddie Mercury (Rami Malek), through his and Queen’s rise to fame. On a stylistic level, the movie shares some similarities with Queens’ music. It is always trying new things, and there are a lot of scenes that are much more visually different than others. In a sense it works because it is reminiscent of Queen’s vast array of musical styles in their work, but at the same time it can feel like it does not necessarily fit with the rest of the movie. Alongside the style, the aesthetics of the movie are incredible. The costume designer does a fantastic job, especially with Mercury’s wardrobe, and the directing and editing that happens when one of Queen’s songs is playing is remarkable to say the least. With all of that said, though, the elements that are below the movie’s pretty look are not as strong. 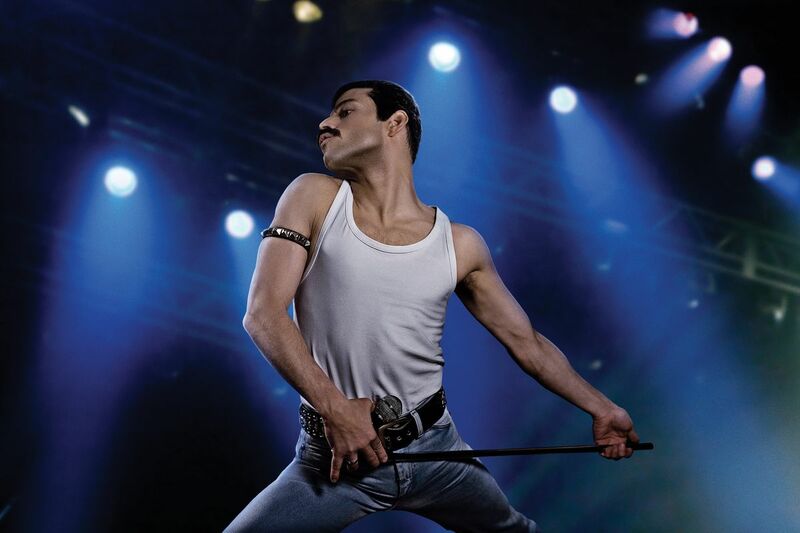 The biopic’s main focus is on Freddie Mercury, and his character is as dull and uninteresting as the movie is. For the first half of the movie, he has no meaningful flaws. He is a smart, fairly likable guy who is a musical genius and all of his ideas work out excessively well for him and the band. When the second part of the movie starts and there needs to be personal drama, Mercury is suddenly a toxic personality who treats everyone around him like dirt. Finally, at the end of the movie, Mercury is being portrayed as a real person with actual depth, but this is 100 minutes too late. Malek does a good job with his portrayal, but the character never feels like a real person and thus is someone that is hard to be invested in. A lot of this most likely falls on the back of the script, which is passable at best, cliché and rudimentary at worst. There are a lot of lines that feel overly contrived or simplistically deep, and there are a number of times where people’s relationships have to be described instead of shown. For example, the audience knows that the band members are close with one another not because of the actor’s chemistry or how the audience sees them interact, but because they continually refer to themselves as a family. Alongside this, the movie feels rushed and simplified. The audience never gets a chance to know Mercury as a character; he just attends a concert one night and finds his bandmates and future wife (Lucy Boynton) all within the first ten minutes; then they are popular, then they have a manager, then they are recording an album and it all happens too quickly and without any room to develop the relationships or the characters. This all serves to simplify the story, as does making Mercury’s personal manager Paul (Allen Leech) an antagonist with no redeeming qualities for the audience to root against. This is Queen’s true story, but it is played as generic as possible. A good way to represent how generic the film acts is with the climax of the movie, which is Queen at the Live Aid concert. What is important in this scene movie-wise is that Mercury and the band are all playing together again and have set their past feuds behind them. However, it also plays like the overused plotline from any generic story about a group of performers where they need to put on a show to do something important. This is the case as during Queen’s set, it cuts to the phone banks ringing off the chart and the fundraiser’s goal being met. Granted, this happened in real life, but the movie’s portrayal of it is done in that overused and generic style. The musical scenes are the highlights of the movie. One, because they are well choreographed and Malek is a talented singer, and two, because they are the only creative or energetic moments in the whole film. That being said, seeing these recreations of Queen performing their music is all the movie really has going for it, so one would be better off just purchasing one of Queen’s albums off of iTunes. It would be more time efficient, much more enjoyable and cost about the same as a movie ticket. “Bohemian Rhapsody” is not the champion, my friends.